John Kotter is a former professor at Harvard Business School. That means, among other things, he knows what he's talking about! I first heard about John Kotter when one of my professors in college made constant references to another one of his books: Leading Change. In Leading Change, Kotter laid out the 8 stages of how to lead change. It's definitely worth your time. 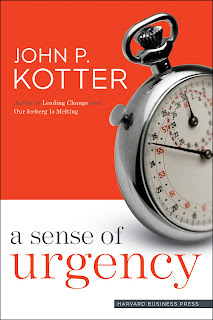 The connection between this book, A Sense of Urgency, and that book is that the first stage in the change process is, "Establishing a sense of urgency." Establishing this sense of urgency - which Kotter defines as, "a gut-level determination to move and win, now" - is important enough to warrant a book all on its own because change efforts most often fail because change leaders "did not create a high enough sense of urgency among enough people to set the stage for making a challenging leap in some new direction" (p. viii). The challenges to true urgency are complacency and false urgency. Kotter observes that "Complacency is almost always the product of success or perceived success" (p. 20). And the success doesn't even need to have been achieved recently. "An organization's many years of prosperity could have ended a decade ago, and yet the complacency created by that prosperity can live on, often because the people involved don't see it" (p. ix). The complacency remains mostly because "the complacent do not alertly look for new opportunities or hazards facing their organizations" (p. 21). While complacency is demonstrated by acceptance of the status quo, false urgency is seen in the frenzy of activity that keeps busy with activities of low-importance. "With a false sense of urgency, the action is much more activity than productivity. It is frenetic. It is more mindless running to protect themselves or attack others than purposive focus on critical opportunities" (p. 25). 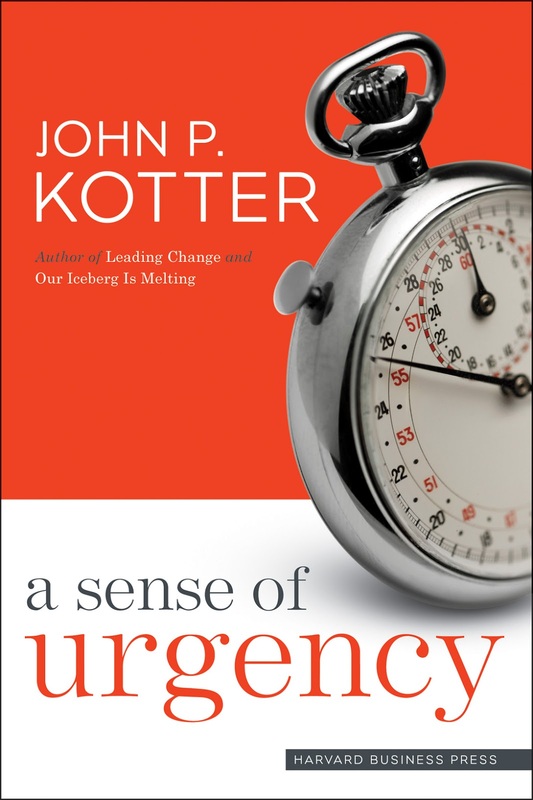 Ultimately, Kotter wants readers to recognize that "both the business-as-usual behavior associated with complacency and the running-in-circles behavior associated with a false sense of urgency are increasingly dangerous" (p. 7). His term "increasingly dangerous" stands out to me. Either of these two mindsets have the potential to kill your organization. They are deadly. That simple acknowledgment, alone, can increase your urgency. If we don't act, and act in high-impact ways on high-importance projects/tasks, then there will be no future for us. After explaining what true urgency is not, Kotter begins to unpack what it is and how to create it. He says, "The winning strategy combines analytically sound, ambitious, but logical goals with methods that help people experience new, often very ambitious goals, as exciting, meaningful, and uplifting - creating a deeply felt determination to move, make it happen, and win, now" (p. 47). 1) Bring the Outside In. 2) Behave with Urgency Every Day. 3) Find Opportunities in Crises. 4) Deal with the NoNos. Each of these tactics are matched with case studies that illustrate their importance, as well as practical suggestions (and cautions) for how to use them well. In the end, Kotter counsels a kind of "urgent patience." With this term, he means to suggest, "acting each day with a sense of urgency but having a realistic view of time" (p. 118). I recommend this book for anyone who is involved in the hard work of leading change. Change takes time, but if you create a true sense of urgency at the start then the time it takes and the challenges you face will be significantly less than if you don't. * For more on this topic, see this post by Michael Hyatt.